This is an idea that has been floating in my head for quite some time now, having come to me one night whilst trying to sleep. Ruminating on the similarities between bolognese and chili I started trying to consider substitutes. Well, finally had the chance to try it out and in a brand new kitchen, no less! The rest was an incredibly filling piece of GastroFusion. Prepare the beef chilli and set aside, simmering. 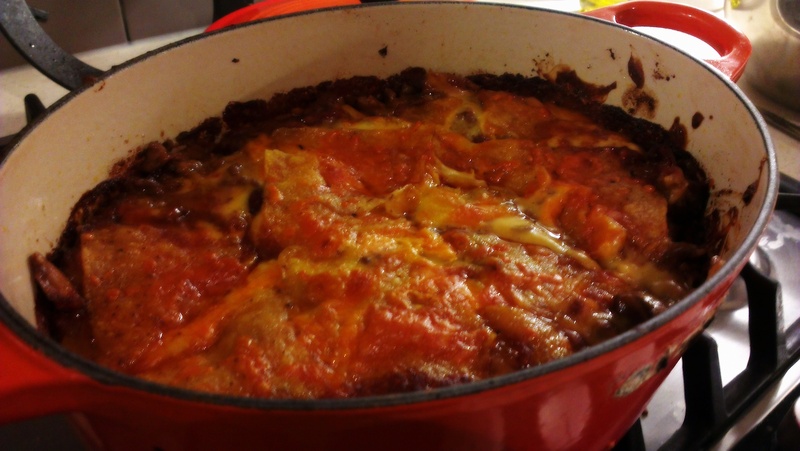 Don’t be afraid to make it a little wetter – this will help the lasagna cook and it will thicken in the oven. 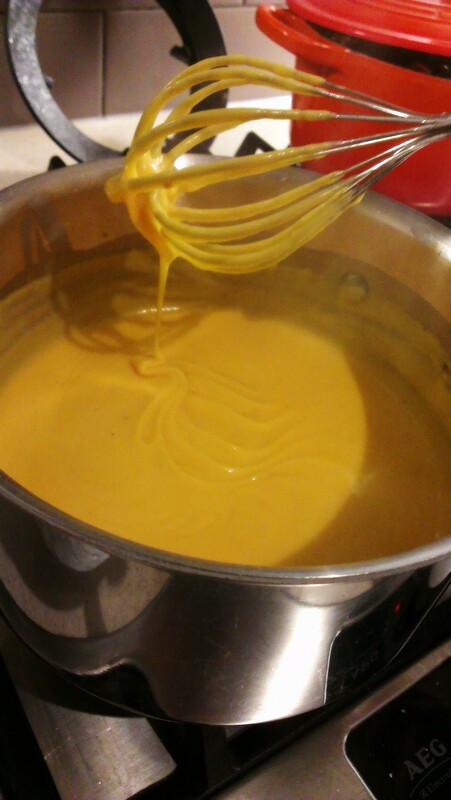 Meanwhile, melt butter in a pan and add flour to prepare a roux. Make it quite large and be sure to cook for a few minutes to avoid having a powdery sauce. Add milk and heat gently, stirring, until it thickens up. 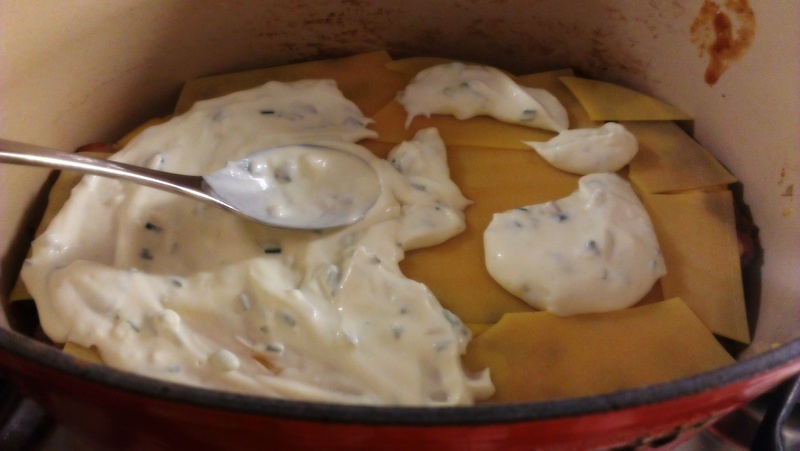 Remember, though, that the melted cheese will thicken it too. Add grated cheese whilst stirring constantly over the lowest heat. 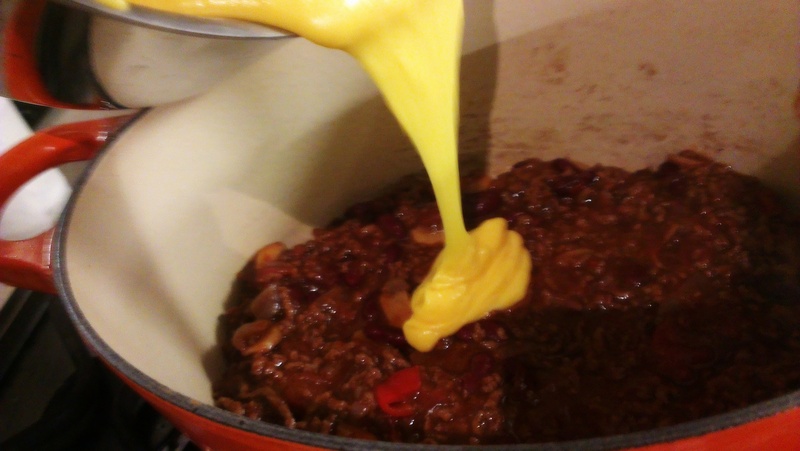 Just keep going, it will all melt in until you have a lovely velvety sauce. If you’d like an even spicier lasagna, by all means add some chili powder, tabasco or whatever tickles your fancy. Now it’s time for assembly. Really, it doesn’t matter which order you go in. But some tips to ensure you have a good balance. 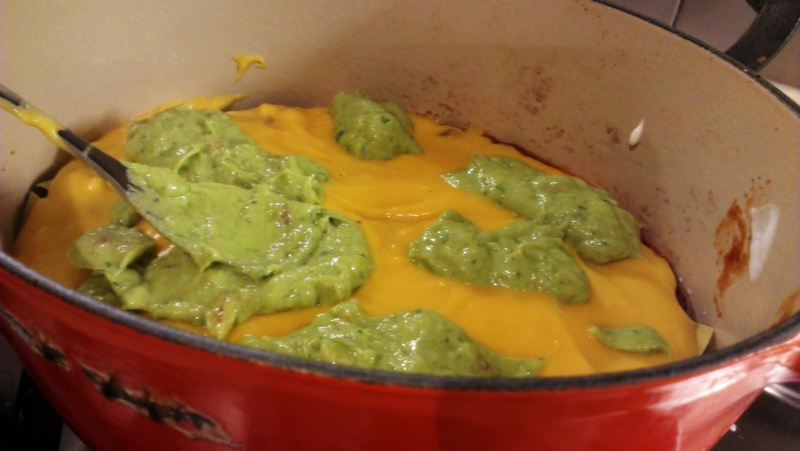 -In order of most to least fillings, have; Chili, Cheese Sauce, Guacamole, Sour Cream and Chive. -Have no more than two fillings sandwiched between each set of sheets. 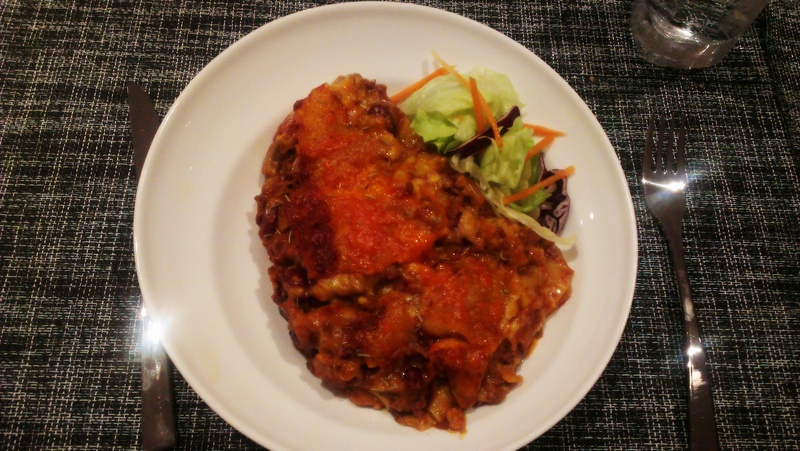 -Do not top with Lasagna sheets – on top of the final layer of sheets you should have Chilli. Also, when putting one filling onto another, add in dollops then gently spread out, rather than being too rough and mixing the layers together. 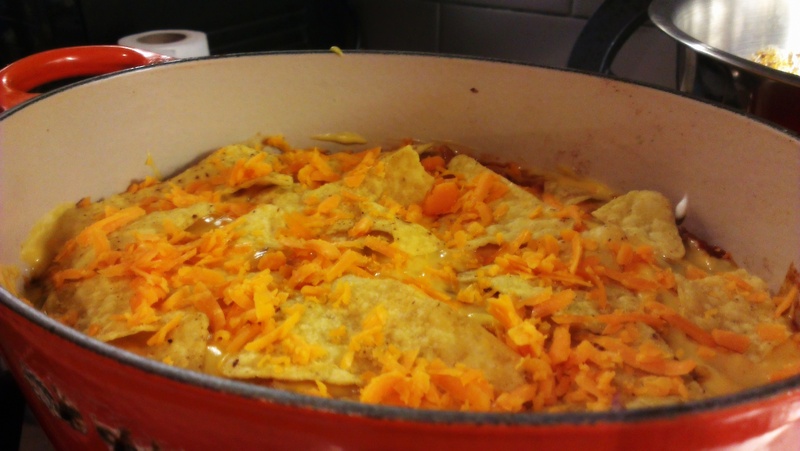 Top with tortilla chips and a little bit of grated cheese. Bake in the oven until the sheets are soft – a thin knife should slip in effortlessly. Allow to cool for at least 10 minutes before serving – this will make it easier to remove from the dish and much nicer to eat. Serve in a bowl with a crunchy side salad and some bread to mop up the fillings. Store in a sealed container in the fridge for no more than two days. It’s significantly if heated in the oven for ten minutes, covered with some tinfoil. 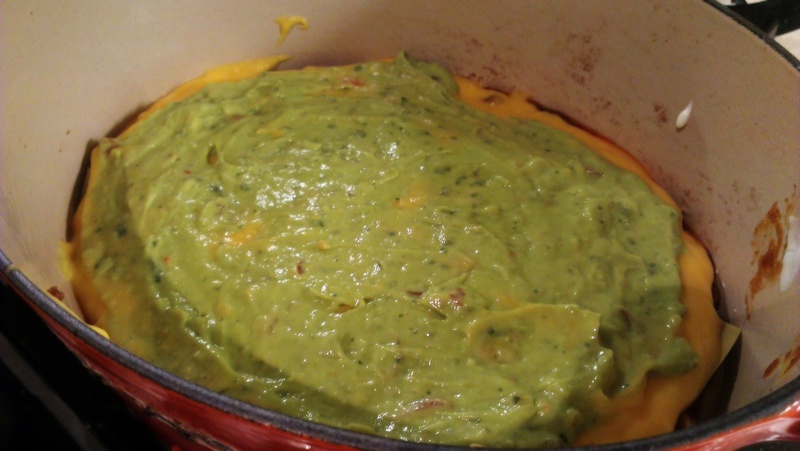 Posted in Beef, Guesscipes, MainsTagged avocado, beef, chilli, food, fusion, guacamole, guesscipe, lasagna, mexican, recipe, sour cream, spicy foodBookmark the permalink.